Why is it important to start the process with individual designs? How does this process encourage students to lead their own learning? How could you adapt this process to work with different grade levels? It was nice watching the student compromise their ideas together to build a specific rocket that they all came together to build. The one thing that I absolutely like was that they had to hit a target at a specific spot and when the rocket would land close or farther away from the target, they would have a chance to fix their calculations. Hi Keith! Thanks for sharing with the group! This type of specific feedback helps the unit to continue to evolve. And I definitely agree that if you have the technology, Google Docs is amazing data sharing vehicle! Take care. I love this video. 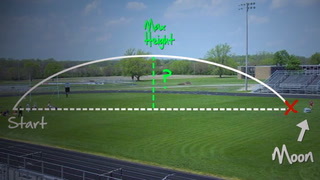 I also do a pneumatic rocket unit but we go for total distance and we restrict our angle to 45 degrees. 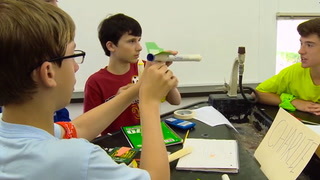 We do 3-4 launches and my students go through the engineering process. We also use google sheets to find out what variables work the best so that everyone can use the shared knowledge to create a great rocket. I love the idea of having the kids try to hit a specific target. Our only restriction might simply be the weather because hitting a target will take a longer time. We perform this activity at the beginning of the year while we still have good weather. With an extra month I would gladly add the target aspect of this video. Thanks for sharing. Speaker 1:	[music] My engineering design process, which is a sum of all of my parts, and all the professional development that I've been fortunate enough to be involved with, involves students looking at a problem, or as a problem that they point out themselves. Then they try to devise a solution. How did that data drive your decision? Sometimes we'll go through them. We'll give a little background. It just depends on what it is. [music] It's impressed upon the students that their initial design needs to be their honest opinion about how they would remedy a situation. I'm looking generally for a production of an artifact, and it could be a system that they'll develop, or a specific tool that they'll use. Speaker 2:	Three, two, one. Speaker 1:	In this case we developed a rocket to hit a target. Speaker 1:	Please draw your individual design for today. I had them draw what their rocket would look like. Make sure to note details as far as all the variables for mass, the number of fins, the type of fins, the orientation. Then also write a little justification statement of why they chose what they did. [music] At this point we're transitioning from the individual design to a group design. After their individual design it's always a collaborative effort. Speaker 4:	We definitely need to keep Idaho fins if we're going to add mass to it. Speaker 1:	I always try to make sure there's three or four people, because with two, you generally don't get enough varied opinions. Three or four is my sweet spot with four being perfect. Make sure everybody gets a chance to speak about their design before we discuss it as a group. Speaker 6:	... The PSI with somewhere between 35 to 40. Speaker 1:	First off, each student takes their turn to talk about their individual design. The expectation is if I'm going to set that time aside for the student's to individually share, they need to have something that they can describe. They need to have plenty of descriptors, they need to have a drawing, so especially when ... Sometimes when vocabulary's lacking in some kids, if they have a picture then they can fully portray to their group what ideas they're going with. Speaker 5:	Then we can just adjust them. Speaker 6:	I think we should do angle 35 and 40. Speaker 5:	It would add 30 feet, if you add a mass to get this. Speaker 6:	We're lowering your angle. Speaker 3:	What about the mass? The mass, I think we should move around two. Speaker 6:	Yeah. I'm thinking two. Speaker 2:	All right. Here we go. Three, two, one. Speaker 1:	During the test, we collect data. Then, we'll come back and analyse the data. If they need to make adaptations because maybe it's at a different point in the process, or modifications, they note that. They always provide reasoning for their choices. Speaker 6:	Since we added the point five grams of mass, it got closer. Speaker 7:	It added a bit of motion to the rocket, so that way in went a little bit farther than it would with the same PSI and angle.